successful, but she did manage to have some of her poetry published. Then one day she penned a story featuring talking insects she'd made up when she was eight. Encouraged by the responses she got, she wrote more stories and in 1976 her first book, The Dog Who Insisted He Wasn't, was published. Since then, Marilyn has published more than 50 books for children and young adults. 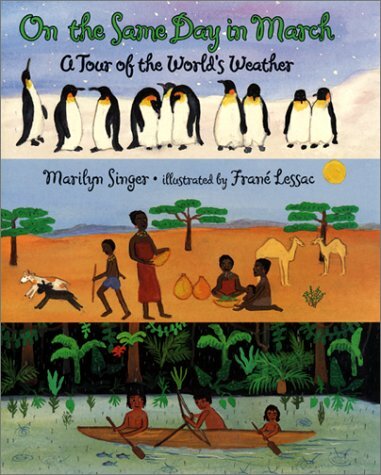 In addition to a rich collection of fiction picture books, Singer has also produced a wide variety of nonfiction works for young readers as well as several poetry volumes in picture book format. Additionally, Singer has edited volumes of short stories for young adult readers, including Stay True: Short Stories for Strong Girls and I Believe in Water: Twelve Brushes with Religion. Ms. Lessac has illustrated and written many books. Her own My Little Island was a Reading Rainbow Featured Selection. Her paintings have been exhibited in galleries throughout the world. She lives in Fremantle, Australia, with her husband, their two children, a cat, and some fish.